Head mounted display (HMD) is a device that comprises a small display positioned in front of the wearer’s eye in order to provide virtual information regarding the environment. The HMD can be monocular (a single display for both eyes) or binocular (a display for each eye) as per the required application. HMDs create a projected environment by displaying information in both graphical and verbal format. HMDs can be categorized into “look-at” HMDs and “see-through” HMDs. The “see-through” HMD provides computer-generated imagery (CGI) based upon a real-world view, while “look-at” HMDs allow wearers to see only the CGI projected by the HMDs. The growing popularity of light-weight wearable computing devices has led to the resurgence of head mounted displays in recent years. The evolution of HMDs is steadily picking up pace, making them lighter in weight, larger in screen size, higher in image quality, easier to use, and more dynamic than other portable devices. North America accounted for the largest revenue share in 2013 and is estimated to remain the dominant market throughout the forecast period. This is attributed to growing preference for portable and wearable computing devices, especially in end-use verticals including defense, healthcare, and safety services. The Asia Pacific HMD market was valued at US$ 144.5 Mn in 2013, and is expected to emerge as the fastest-growing market in the coming years. Surging demand from the consumer, defense services, and medical practices segments is expected to drive the market’s growth in the region. The consumer market is expected to exhibit the fastest growth over the forecast period from 2014 to 2022. Advancements in display technologies with superior video capabilities such as 3D view and high resolution is primarily responsible for the projected increase in demand for these devices. Defense services, comprising armies, navies, and air forces, was the largest end-use segment, accounting for around 73% of the total market revenue in 2013. Product penetration of head mounted displays is expected to gain momentum in emerging economies with key advancements in display and computing technologies during the latter half of the forecast period. These advancements have extended the applications of head mounted displays to a wide range of end-use verticals, including medical practices, sports, automation, and consumer markets. The declining prices of micro-displays, regulated demand from defense services, and increased penetration in consumer markets are collectively fueling market growth. However, lack of awareness and standard design specifications, especially in emerging economies, is expected to hamper the swift growth of HMDs at the beginning of the forecast period. Virtual automotive prototyping provides huge opportunities to the HMD market. The use of HMDs for automotive prototyping provides an opportunity to virtually design a car and evaluate the exact positions of different parts in the vehicle. In terms of product type, helmet mounted displays dominated the HMD market. However, wearable glass HMDs are expected to surpass helmet mounted displays in the coming years owing to the inclination of users toward light-weight head-worn display devices. Major industry participants include BAE Systems Plc, Elbit Systems Ltd., Vuzix Corporation, eMagin Corporation, Sony Corporation, Kopin Corporation, Rockwell Collins, and Seiko Epson Corporation. Growing preference for lightweight, portable head worn displays resulting in increased demand from the consumer segment is the major factor driving the demand for head mounted displays across the globe. In addition, regulated demand from defense services has fueled market momentum. The research study titled - Head Mounted Display (Helmet Mounted Display, Wearable Computing Glasses) Market - Global Industry Analysis, Size, Share, Growth, Trends and Forecast, 2014 - 2022 provides strategic analysis of the global head mounted display market along with the market growth (size in US$ Mn) forecast for the period from 2014 to 2022. The report includes competitive analysis of various market segments based on product type, end-use, applications, components, and in-depth cross-sectional scrutiny across different geography segments of the head mounted display market. In order to aid in strategic decision-making, the report also includes competitive profiling of the leading head mounted display manufacturers in the industry, their market positioning, recent developments, and the winning strategies adopted by them. The value chain analysis included in the report provides information on OEMs, HMD manufacturers, and application providers. It also highlights the role played by each in adding value to end products. Other in-depth analysis covered in the report provides insights into industry competition, market dynamics, and the most profitable segments in the head mounted display market. Furthermore, the report analyzes the current and future market potential for the head mounted displays across the globe. On the basis of end-use applications, the head mounted display market is segmented into: defense services (military, air force, navy), consumer market (video gaming, augmented reality, virtual reality), and others (automation, medical practices, sports, safety services, police force, commercial aviation). The market revenue and forecast for different end-use verticals have been included in the report for the period from 2012 to 2022 in terms of US$ million, along with the CAGR for the forecast period from 2014 to 2022. Furthermore, the report also segments the head mounted display market on the basis of product types into helmet mounted displays and wearable glass solutions. On the basis of application, the head mounted display market is segmented into training and simulation, security, tracking, and imaging. The market revenue and forecast for different product types and applications have been included in the report for the period from 2012 to 2022 in terms of US$ million, along with the CAGR for the forecast period from 2014 to 2022. 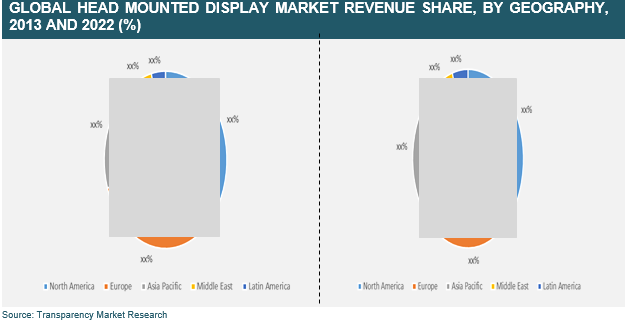 The regional analysis of the head mounted display market gives in-depth insights into the current trends prevailing in different regions including North America, Europe, Asia Pacific, Middle East and Africa, Latin America. Each of these segments provides market size and forecast for the period from 2012 to 2022, highlighting the key factors responsible for influencing and challenging the market growth. The report also provides the breakdown and review of various factors affecting the growth of head mounted display market, appropriately described as market drivers, restraints, and opportunities. These factors emphasize upon the existing trends and their impact on the market growth. In addition, the report provides a separate section focusing on the key trends and future outlook of the head mounted display market. Overall, the report includes a holistic analysis of the global head mounted display market and provides growth estimates for the period from 2014 to 2022, keeping in mind the various factors affecting the market.